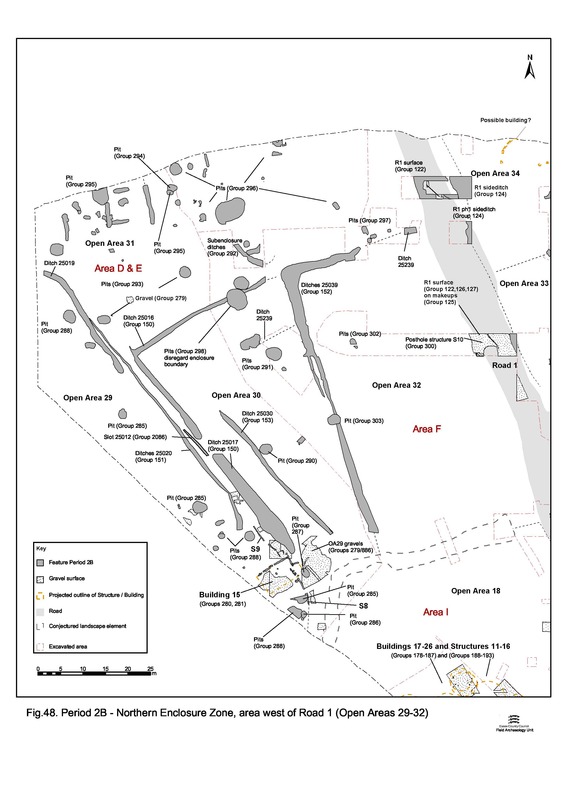 Open Area 29 (Figure 48) is created in Period 2B, as part of the creation of a new enclosure system across the northern part of the lower terrace, west of Road 1. Only its eastern edge is exposed within Excavation Area D, the remainder extending beyond the site limit. Almost the full north-south length of this enclosure may be exposed, collectively defined along its east side by ditches 25017, 25019 and 25020. Its interior is occupied by a rectilinear building that seems to be deliberately located at an access point between OAs 29 and 31, and perhaps with the Central Zone. Fences and the majority of the pits apparently focus upon this structure. The principal area of gravel surfacing (deposits 9233, 9386, 9490, 9589, 9601, 9636, 9722, 9744, 9753, 9761 Group 279, 9717 Group 886) is located in the vicinity of Building 15. 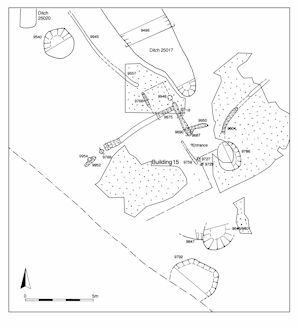 Deposit 9589 is a large expanse of gravel that has been truncated by machining at its northern and eastern edges and by Roman period ditches to the south, but survives across an area of c. 8.2 x 5.6m. It is laid upon a deposit of brickearth. Although it was not established if the brickearth itself is a redeposited layer on top of similar natural deposits, it is likely that this was a deliberately raised area on which the building stands. Certainly, the gravel surface overlies Period 2A features (e.g. gully 25231). Further vestiges of this same surface are present some 5m to the north-west. The exact extent of all this surfacing is undetermined. The minimalist position is to regard the area occupied by the building as raised and surfaced, with an area extending out to the east (to its front?) and northward, up the 'corridor' between ditches 25020 and 25017. However, it is possible that a very much wider expanse could have been surfaced. A group of post-holes and slots (Groups 280, 281) define a rectilinear structure located in the south-east corner of OA29 (Figure 49). Parts of at least two sides of the structure are represented, indicating a building in excess of 8m long and 5m wide, with a possible small square addition at its northernmost corner. The south side of the building is removed by later ditches. This structure had a similar alignment to the surrounding Period 2 enclosure system and is located just beyond the southern end of boundary ditch 25017 (Group 150), with which it is deemed to be contemporary. This relationship is perhaps emphasised by the shape of the terminal of ditch 25017 which respects the northern corner of the building even after widening. There are other, unphased, post- and stake-holes adjacent to this building that cannot easily be incorporated into the plan of this structure but may well constitute further occupation activity in its vicinity. Judging by the location and perpetuation of points of access and apparent livestock management features built into the enclosure system in this vicinity, this building was perhaps a focal point in this layout. It is likely that Building 15 continues to function into the late 1st century AD (Period 3). 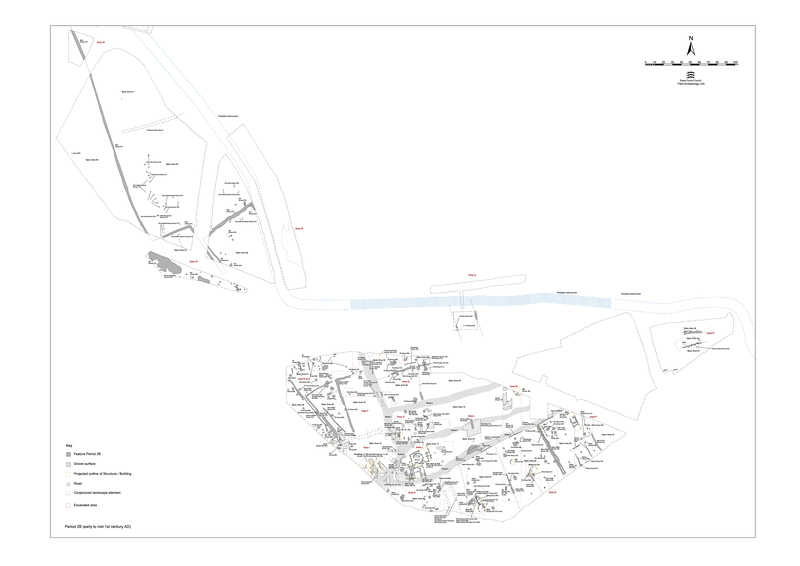 Structures 7, 8 and 9 (Group 284) comprise various sections of narrow, straight or slightly curving, slots located in the immediate vicinity of Building 15. All contain single fills with no post- or stake-holes present within them. All extend away from the walls of the building and are presumed to be the foundations of associated fencelines. 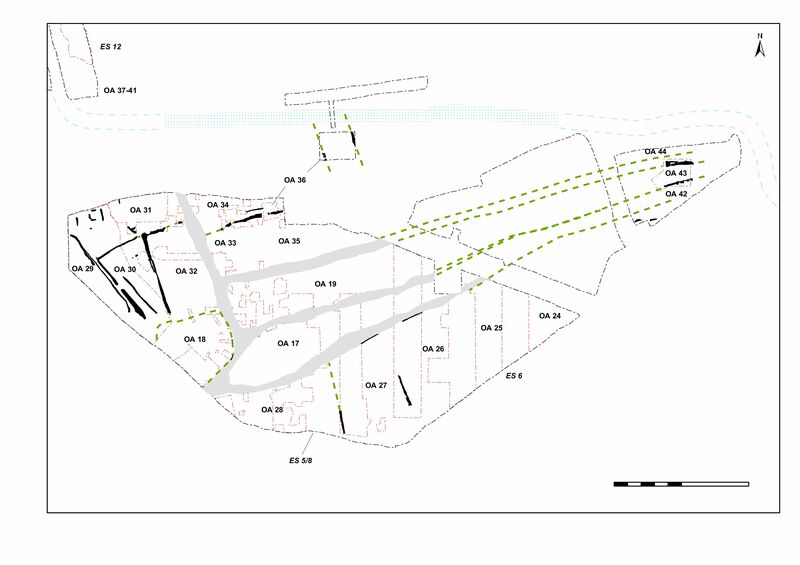 Although perhaps technically more within OA30, Structure 7 comprises slot 9604 (Group 282) that extends eastwards from Building 15. It also cuts the gravel surfacing in front of the building. Structure 8 comprises slot 9836 (Group 283) that extends southwards from Building 15 for a distance of c. 6m. Structure 9 comprises slot fragments 9557 and 9945 that are traced for c. 7m north of the building. It mirrors a bulge in the line of adjacent ditch 25017 and may indicate the presence of a barrier alongside it. 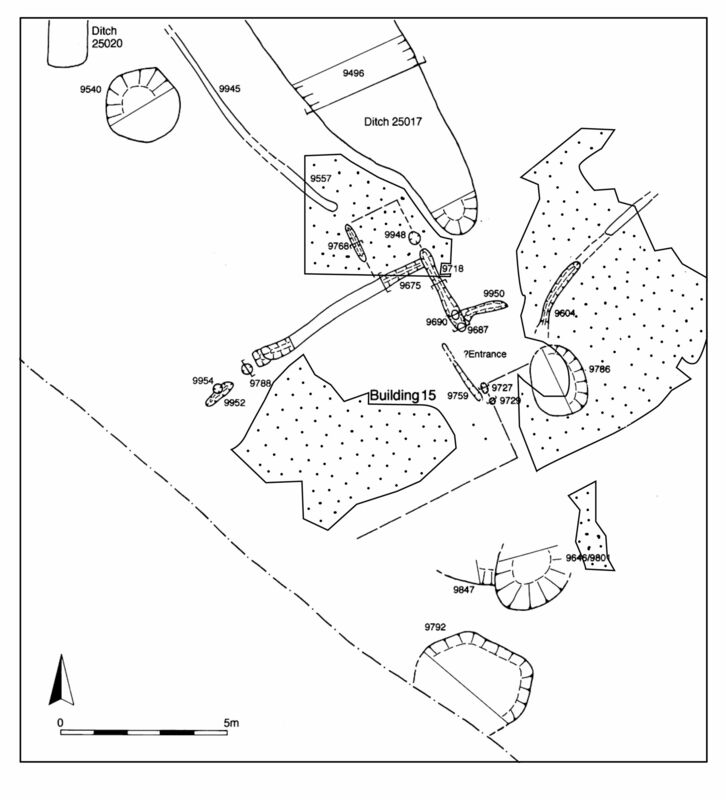 Not many of the Late Iron Age pits can definitely be assigned to Period 2B (i.e. earlier/mid-1st century). Those that can (9230, 9466, 9540, 9792, 9801, 9847 Group 288) are in the main apparently clustered either side of Building 15. The ceramics from these pits seem to represent a truly transitional phase in the pottery of the 1st century (e.g. 9230, KPG13). They uniformly yielded more pottery than the earlier pits, so they may be significant assemblages for the study of this transition, sometimes with apparent progression within the fill sequences of individual pits (e.g. 9540, 9792, 9801). The more generally dated (broadly Period 2) pits (9258, 9262, 9445, 9471, 9518, 9521, 9846 Group 285, 9543 Group 286, 9786 Group 287) are large and circular, generally being 2m-3m across. These could well be contemporary with the occupation of this enclosure and display a similar distribution to those more securely dated to Period 2B. Overall, frequency of pitting and the degree of inter-cutting are relatively low compared to other areas of the settlement (e.g. Southern Zone). Artefact assemblages are dominated by grog-tempered pottery, and baked clay and metalwork are generally rare. The occasional presence of small quantities of Roman brick and tile may emphasise the transitional nature of some of these pits.